My beautiful wife decided that for my birthday she would surprise me with a fisheye lens. I have been thinking of a fisheye for some time, but seeing one at a recent wedding got me thinking again. The images it can produce are truly unique to any other lens out there. Just a simple tilt of the lens and the scenery can give you a great big smile. These are some of my first images taken with the lens. All of them were within 15 minutes since it was a last minute test. All photos were taken with the sunset at my back. You can see from the 4th image the large cloud bank that had developed just before the sun set blocking any chance at a great colorful evening. This photo was taken of the exact same spot, just tilted the camera up a little bit to get a little more sky. I decided to move down the road a little and split the difference. The heavy cloud bank on the left was blocking out the sun so I turned 90 degrees to get some of the color from the fading sun. To see more from the shoot, please check out my webpage by clicking on any of the photos above. You can also visit my landscape gallery at alderimages.com/landscape. I have decided to try to get more landscapes in my life. I have found that panoramas give a little more to the scene than your average wide angle shot. Shooting with a wide angle lens you get basically the same shot; however, with a longer focal length it seems like the distant landscape is actually in the picture. Shooting with a wide angle lens, it actually makes the distant landscape seem more distant. 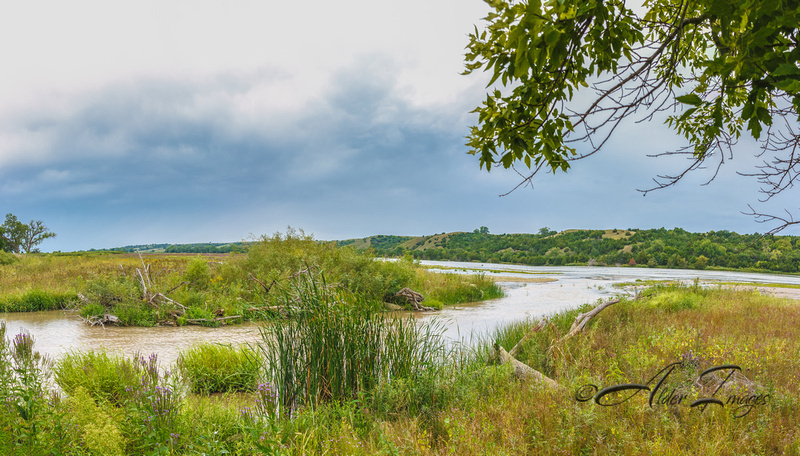 This is a panorama of a tributary flowing into the Niobrara River. The Niobrara is a special river to Nebraska as it provides tourism and some of the most beautiful scenery in the state. If you were to move further up the river, a tributary to the Niobrara has the largest waterfall in the state. That waterfall is called Smith Falls. This is a panorama of 10 vertical images edited in Lightroom and stitched together in Photoshop. In a previous post, I explained this shot. This was a 33 shot panorama shot in vertical orientation, edited in Lightroom and stitched in Photoshop. This photo was taken shortly before the "Sunset on the Prairie". The clouds were very cool and the sun was making sun patches across the sky. Originally I thought this would be a great location to get a sunset photo, but the road was way to slick from the rainfall that occurred just before we traveled on it. 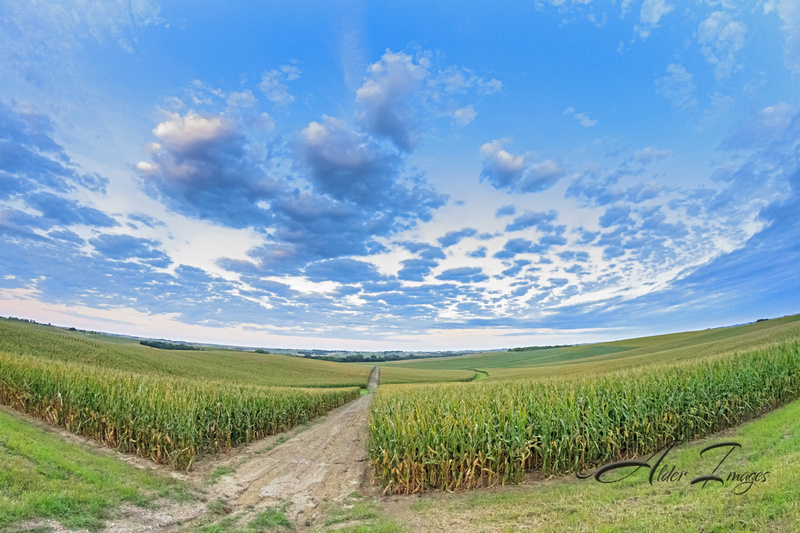 From the photo, you can see what stitching a photo at 180 degrees can do to the foreground. This photo it is especially pronounced because of the fence line accompanying the scenic overlook. This photo is a 17 shot stitched panorama. There would have been more but I was moving too quickly across the frame as I was rotating and some of the shots were blurry. I took this on our walk around the lake. I have always enjoyed this little area of the lake. It is secluded and the water is usually very calm. I believe there use to be a dock where the poles are sticking out of the water. This is one of my favorite panoramas. It definitely isn't my best but it has the most meaning. I traveled through Pilger, NE a couple days after the EF-4 twin tornado struck the area. I captured this Panorama showing the path of destruction. This was the second of the two twins that passed over the area. The first struck the city of Pilger. The second make its way on the outskirts of town and up the hill, destroying a feedlot and killing many of the cattle located there. The fire burring on the right side of the frame contained many of the downed trees, buildings, and I would assume cattle from this location. This is the panorama I took prior to the old barn photo. I initially stopped to photo this expansive view or field after field of soy beans, but discovered the barn nestled in the trees behind me. This was one of my first panorama photos. I snapped this after a visit to Boyer Chute National Wildlife Refuge shortly after the great flood of 2011. This is on the southern side of the Missouri River that was the lowest lying in the area. This desert looking area is where the river deposited massive amounts of sand as it crossed over this area. The area still hasn't recovered completely and I don't know if it ever will. I wanted to have the foreground in focus more than anything due to the sand waves the wind had created.